It certainly is exciting being part of a team designing and building New York City's first zero-energy office/studio/home. Yes that's right, I have researched quite a bit and I am fairly certain that we are blazing a trail less (or never) traveled. There are many great examples all over the country, but the Big Apple does seem to be lagging a bit on adopting new building technologies. If you can find any examples please pass them along, I'd love to post them. Thanks to all of you, who posted comments and sent emails with your thoughts and opinions on your favorite design for the building. Option two was the overwhelming winner amongst the readers as well as mine. 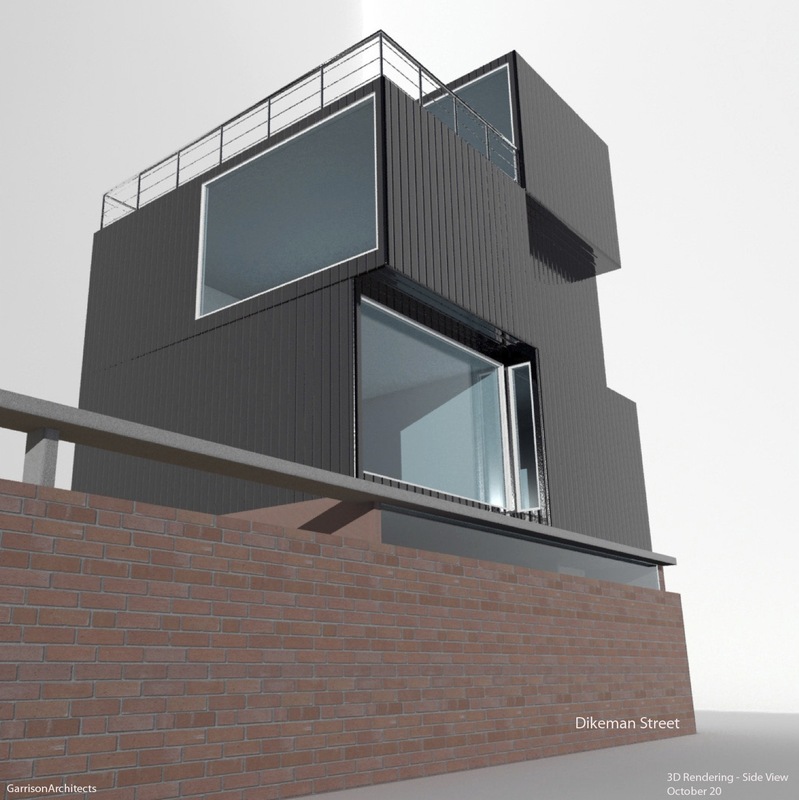 This first 3D rendering of the project, represents the second option as it was originally envisioned. This design, as presented to me by Jim Garrison and his team, makes an attempt to integrate key neighborhood themes. While the brick ground floor provides the structural support for the modular buildings, the walls for the garage and the green space, it also works to blend with the historical nature of the many neighboring Civil War era warehouses. The very container-like metal and glass factory-built modular sections (aka "boxes") pay tribute to the rich stevedoring history of Redhook. This floor plan provided for 3,031 square feet, including about 800 for the garages/workshop/studio, but not including outdoor space and balconies. As the design evolved, the rooms began to grow to accommodate live/work needs and code requirements. Actually it grew quite a bit, all the way to 3,964 square feet. 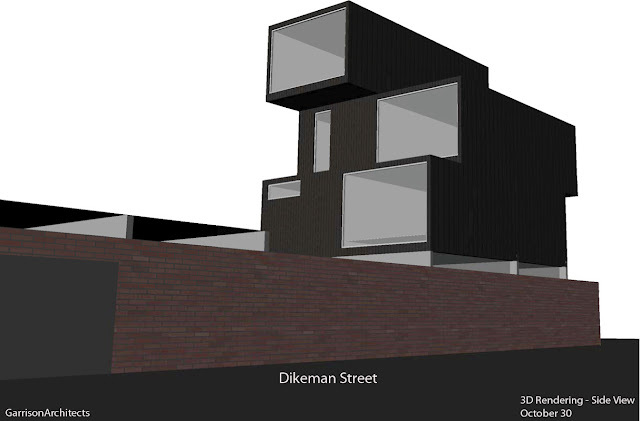 At that point the "boxes" shifted from a perpendicular orientation with Dikeman Street, to a parallel one in order to accommodate the larger rooms. The design below, illustrates those changes in addition to balconies on top floor (the den/office) and third (living suite). The roof of the top floor will be home to an array of solar PV panels to provide electric generation to help us reach our zero-energy objective!